When the Burj Khalifa opened a little more than a year ago, international attention focused, laser-like and rightly so, on this neo-Emerald City apparition in the Dubai desert. Its dizzying half-mile height and status as the world's tallest building were matched only by an elegant form that pierces, needle-like, the Middle East horizon. The 2,717-foot-tall building was designed by the Chicago office of Skidmore Owings & Merrill (SOM). 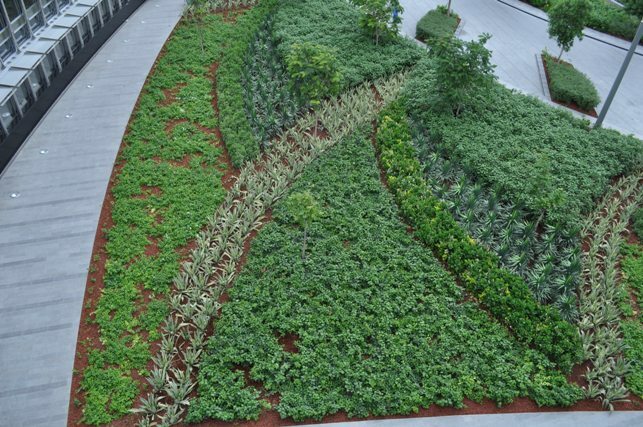 Often overlooked at the time, however, was the geometric and intricately patterned landscaping at its base. It's the work of John Wong, managing principal and chairman of the board at SWA Group in Sausalito, Calif.
And it's best viewed from above. "I had the opportunity to climb up to the top of the building and look down on it all," said George Efstathiou, consulting partner at SOM and one of the principal architects on the project. "It was hard to see the building from a half-mile up, but interesting to see the geometry in the patterns of the landscape and hardscape." Wong's very elegant solution is a connective tissue that addresses the three-prong form of the building's base, as well as how it relates to its neighborhood and the city. His 27-acre park reaches out to a shallow lake nearby as well as to a 2.2 mile long, Michigan Avenue-style boulevard nearby. 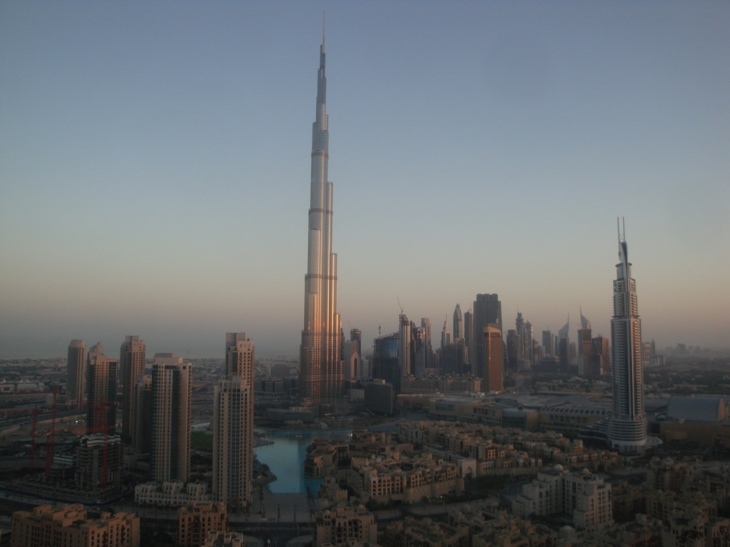 "The Burj has become a major focal point in the city," Wong said. "People go and spend an entire day there to shop, work and be entertained." He carefully addressed the special needs of each of the skyscraper's three entrances -- for its Armani Hotel, its condominiums and its offices. 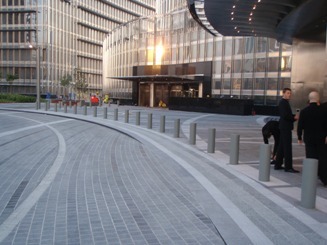 Automobiles are the primary means of transportation to the building, but once a guest arrives, Wong provided a one-of a kind pedestrian orientation. 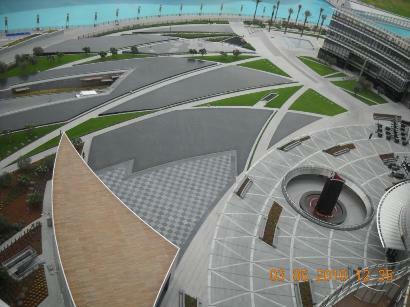 The terminus of one entrance edges up to the lake, another to a mall and a third, to Emaar Boulevard with its allees of palms and six lanes of traffic. "Very simply, we wanted to create a park-like setting for the tower," Wong said. "There's a terrace that steps down to the lake, where we were trying to create a cool oasis, since the environment is very hot -- six months out of the year, it's above 100 degrees. It gives you a nice cool feeling in a very hot climate." He created a series of refreshing outdoor living rooms for the enjoyment of hotel guests, office workers and condominium owners, while providing boundaries among the three groups. 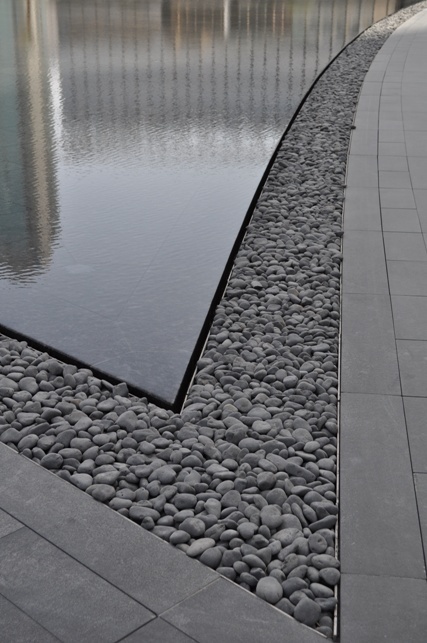 A grand terrace offers a water feature -- a series of fountains -- that creates a subtle separation between public promenade and hotel entrance. His cool palette of gray and black blocks of granite extends into the landscape, which is made up of a series of bands of lush indigenous desert plants in varying shades of cool greens. They're watered by an irrigation system that shrewdly re-uses gray water from the tower's air conditioning. Fifteen million gallons of water a year from interior condensation provide fifty percent of the plants' needs. Wong took his cues from the shape of the building, which itself is a metaphor for a desert flower. Within his intersecting design are a series of distinctive petals that reflect those of the tower above, with concentric, radiating arcs and criss-crossing lines. "The flower," he said, "was the form-giver."